AgroAtlas - Crops - Bromopsis inermis (Leyss.) Holub. - Hungarian brome or awnless brome. Bromopsis inermis (Leyss.) Holub. - Hungarian brome or awnless brome. Zerna inermis (Leyss.) Lindm., Bromus inermis Leyss. Chromosome number: 2n = 28, 42, 56. Perennial plant, robust, hairless, with long rhizomes. Root system is well-developed. Stems erect, 80-160 cm tall. Blade rolled when young, large (5-12 mm), rough. Ligule very short (1 mm), truncate. No auricles. Panicle-like inflorescence up to 10-16 cm in length, oblong, sometimes compact, with erect branches, half-verticillate. Spikelets with 5-12 flowers, exceptionally awned. The weight of 1000 seeds is 3.5 to 3.8 g. Blossoms in June; seeds ripen in July. Cross-pollinated by wind. Cultivation of this species began in the 1840s. Cultivated on large forest plots, as well as in steppe and mountain areas of 118 regions and republics of the former USSR. The state has sanctioned 15 breeding cultivars for forage and pasture purposes. Meso-xerophyte, adapted to temperate regions. Resistant to drought; moisture sensitive. 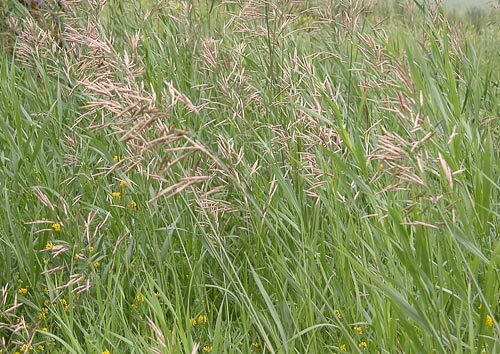 Grass can endure standing water in the spring (for up to two months). Very cold-resistant and frost-resistant. Resistant to early fall and late spring frosts. Does well on all main soil types in forest and steppe zones excluding acidic, salty and heavy soils. Does not tolerate shade. Used for hay and silage. Valuable component of grass mixtures (comprises 25-35% of mixtures) for cultural, long-lived pastures. Tall forms are used for artificial haylands (comprises 40% in mixtures with alfalfa, sainfoin, clover and crested wheatgrass). Re-grows at the end of April and is consequently good for grazing in the first part of May or for early harvest. Decent re-growth occurs after 3-4 grazings. High palatability. Improves soil composition and fertility. Used for erosion control. Forage yield is approximately 25.0-40.0 MT/ha; dry matter yield is 6.5-9.5 MT/ha; average seed yield is 200-700 kg/ha. Used as a lawn grass, too. Catalog of agricultural crop cultivars permitted in Byelorussia. 1985. - Minsk: Uradjai, 176 pp. (in Russian). Catalog of state-permitted cultivars of agricultural crops. 1985. - M.: Kolos, Vol 3. 489 pp. (in Russian). Golovkin B.N. 1988. Cultigenic plant area. Moscow: Nauka, 184 pp. (in Russian). Medvedev P.F., Smetannikova A.I. 1981. The forage crops of European part of the USSR. Leningrad: Kolos, 336 pp. (in Russian). Shashko D.N. 1967. Agroclimatic region of the USSR. Moscow: Kolos, 335 pp. (in Russian). Shashko D.N. 1985. Agroclimatic resources of the USSR. Moscow: Kolos, 248 pp. (in Russian). Soil resources of the USSR (Agricultural regions of areas and republics of USSR). 1990. Moscow. Vol 1. 260 pp. (in Russian).